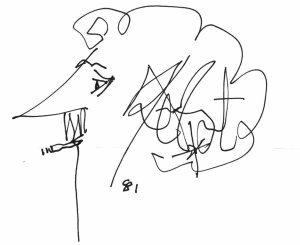 Kurt Vonnegut’s portrait signature is forever something to be remembered by. Simplistic in it’s execution, it says a lot about the man; his wild hair depicting his no-boundary style of work, his forever-in-thought eyes, his signature in the middle of it all, representing the clutter in his mind that most writers and creative folk are merely impacted with. A friend and I were talking about this the other day. Me: You know some hipster douche bag is going to try and recreate this with their name and their portrait then brand it as their own and call it a ‘coincidence’. Friend: Of course… In fact, you should be the first douche bag to do it. Friend: I wouldn’t say that. Your nose is kind of adorable. I dreamt of turtles early this morning before waking. I was standing on a quiet lakeshore. Fifteen feet in front of me was a piece of driftwood sitting in the quiet water. It was typically the kind of driftwood that turtles sun themselves on. It was about 8” high above the water in the middle and had an angled flat top. One side came out of the water long and straight to the center and the opposite side curved into the water like a slide. A young painted turtle swam up to it, climbed to the top and then belly-flopped into the water. It repeated this several times. There was someone on the shoreline with me but I couldn’t see who it was. But we did speak in harmony about the nature moment we were witnessing. The small turtle suddenly refined its diving method. Instead of propelling itself off the top of the driftwood, it decided to use the curve of the wood as a slide and instead of belly flopping into the water it quietly slid into the water. It repeated this seemingly preferred method of water play several times. Suddenly, I could see the shell of an adult turtle under the clear water heading towards the driftwood. Its shell rose above the water line. It met the younger turtle and they swam away towards deeper water. In Indian mythology the turtle is the creature in which souls wait on their way to nirvana, and since usually wiser souls make it to nirvana, that may be the way in which turtles became synonymous with the intellect.